'Bretherick' is widely accepted as the reference work on reactive chemical hazards and is essential for all those working with chemicals. It attempts to include every chemical for which documented information on reactive hazards has been found. The text covers over 5000 elements and compounds and as many again of secondary entries involving two or more compounds. One of its most valuable features is the extensive cross referencing throughout both sections which links similar compounds or incidents not obviously related. 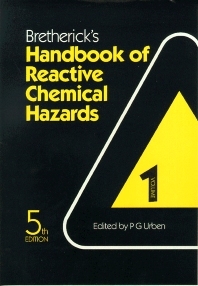 The fifth edition has been completely updated and revised by the new Editor and contains documented information on hazards and appropriate references up to 1994, although the text still follows the format of previous editions. Volume 1 is devoted to specific information on the stability of the listed compounds, or the reactivity of mixtures of two or more of them under various circumstances. Each compound is identified by an UPAC-based name, the CAS registry number, its empirical formula and structure. Each description of an incident or violent reaction gives reference to the original literature. Each chemical is classified on the basis of similarities in structure or reactivity, and these groups are listed alphabetically in Volume 2. The group entries contain a complete listing of all the compounds in Volume 1 assigned to that group to assist cross referral to similar compounds. Volume 2 also contains hazard topic entries arranged alphabetically, some with lists. Appendices include a fire related data table for higher risk chemicals, indexes of registry numbers and chemical names as well as reference abbreviations and a glossary. Chemists, safety officers, research students, chemistry teachers in schools, colleges & universities, those involved in storage, handling, packing & transportation of chemicals. Dr Peter Urben is a now retired organic chemist of initially academic, later industrial, background who has undertaken practical work in many fields, at milligram to tonne scale, over more than forty years, (even neglecting juvenile essays in pyrotechny and blasting).